Here you will find ADAPTER and HOSE “T” air splitters. Similar to the Adapter and Hose “Y” splitters, the “T” splitters come in various sizes. Remember, ADAPTER splitters are designed to work in conjunction with the air output collar on the unit itself (splitter placed directly on the unit). The HOSE splitters are designed to accept ducting on all three ports. They are sized the same way as the “Y” fittings. AT664 – Adapter T- 6″ ON the air output collar. 6″ duct one direction, 6″ duct another direction. 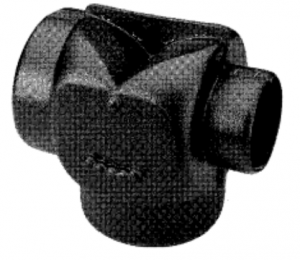 HT644 – Hose T – 6″ incoming duct (main), 4″ duct one direction, 4″ duct another direction.